Our club depends on parents for refereeing their games. While not everyone feels comfortable refereeing some of the older grades it is not difficult in the younger grades. Please give it a go. Each team will referee one half of the game, except for JPL and JPL Promo games where the home referee controls the whole game. Becoming a Referee allows the opportunity to get close to the action. As your child gets older, it also becomes necessary for each team to provide a Club Based Referee (CBR) as Coaches are not allowed to referee their own team’s games. If more than one parent per team is qualified to be a Referee then it shares the load. Capital Football in partnership with New Zealand Football run numerous Refereeing Course, for further details please visit Capital Football Referee Courses. OJFC pays the cost of these courses for interested parents/coaches/referees. For more information about becoming a referee visit: Capital Football – Becoming a Referee. Referees of Grades 10, 11 and 12 travel leagues, Capital Football require a referee with an Introduction to Refereeing Qualification. Referees for Grades 13 and 14/15 travel leagues, Capital Football require a Level 1 Refereeing Qualification. 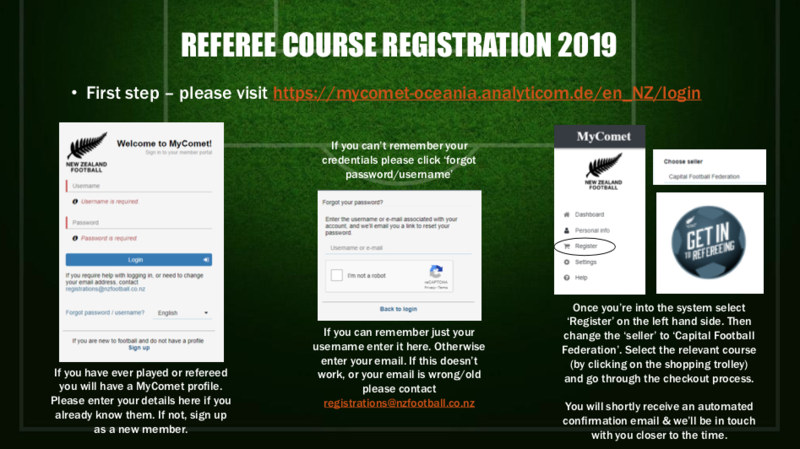 To attend a Refereeing course you will need to register on New Zealand Football’s MyComet system. See below for instructions how to do this. Go to Mycomet.